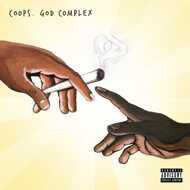 Finally, after a fair few months of anticipation, Coops has dropped his debut LP, God Complex, the follow up to his revered mixtape, Lost Soul. The 15-track effort is Coops attempting to consolidate his place as one of the most exciting Hip Hop acts in the UK, spitting smart, slick rhymes over masterfully constructed instrumentation, soaked in the true essence of Hip Hop. Dope music of pensive, expressive rap covering themes of spirituality, self-belief and unshakeable vices.